The Titanium is essentially the same as the Powerball, down to the MSRP. Aesthetically, there are some differences. The vertical pump grip has been replaced with a shotgun-type grip. The housing for the handle and trigger now includes a hand guard. The shell itself has a bit more of a sci-fi future styling to it, as well. As with the Accelerator, there are interchangeable tags for identifying with red or blue teams. It’s a nice touch, and still allows for fairly easy identification. 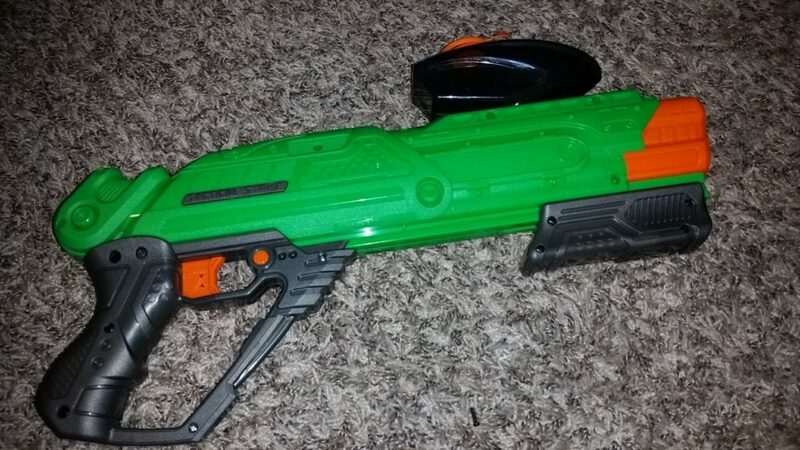 Even if the majority of the blaster is still green. Internally, you’ll find the mechanisms are largely the same as well. The springs are physically different, although the level of power still feels roughly the same. The Titanium also lacks the ratcheting mechanism from the Powerball – you have to prime the blaster all in one shot, so decent arm strength is required. The most important difference is the presence of an actual air valve (“AR”) and a pin that opens it up when a ball is loaded for firing. The Powerball simply elected to have a padded plunger and hoped for the best in terms of durability. While mine have yet to show visible damage, Prime Time Toys went with the “cushion of air” method to slow the plunger once the round is fired. In case of jams, there is an orange tab on the left side of the shell that allows you to pull back the pump grip. Prime Time Toys STILL HASN’T REPLACED THE LOADING TAB. 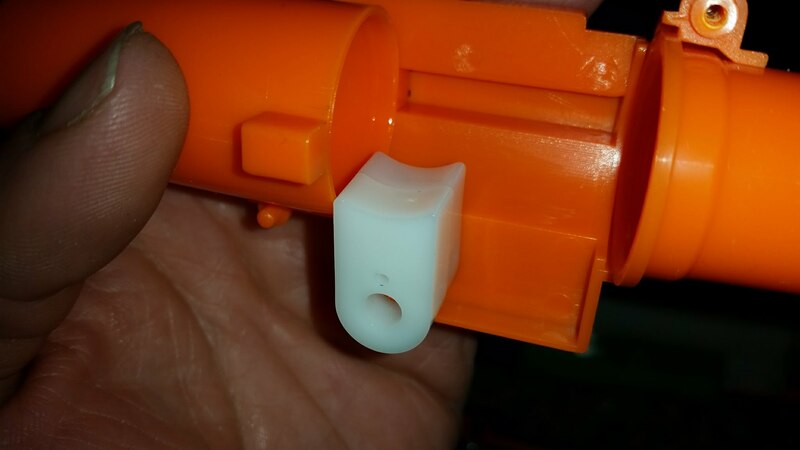 This was an issue in the Powerball that caused double feeding with Rival mags, and I drew up a quick replacement for 3D printing. I did a redesign, however, and posted here. It works in both the Powerball and Titanium, and should solve the issue once and for all. Mainly, I redid the curve at the end, and widened the pivot hole slightly so that it fit correctly. On my chronograph, my Titanium averaged 90fps. Still decent performance, although I’m used to the Powerball (which shoots faster). As an experiment, I removed the air valve in one Titanium, and the result was in fact Powerball-level velocities. I’d still recommend leaving the valve, however. The newer plunger isn’t padded, and the little bit of extra velocity isn’t much of a gain compared to the internals slamming against each other constantly. In addition, I had a Titanium out for use at the recent BG Undead indoor war, floating around and being used in various game types. It worked the entire time, and the new loading tab had zero issues. With the 25 round hopper from the Accelerator added, it can basically fulfill the role of an Artemis for much less – the inherent movement involved means the hopper stays agitated. 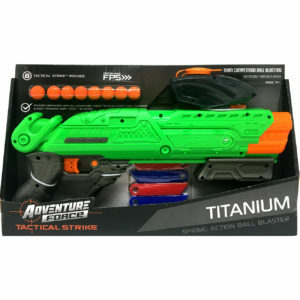 Prime Time Toys has a viable alternative to Rival in their lineup, and having the Titanium (as well as the Accelerator) as part of Walmart’s Adventure Force line could mean great success. Thankfully, the Titanium is a good blaster. 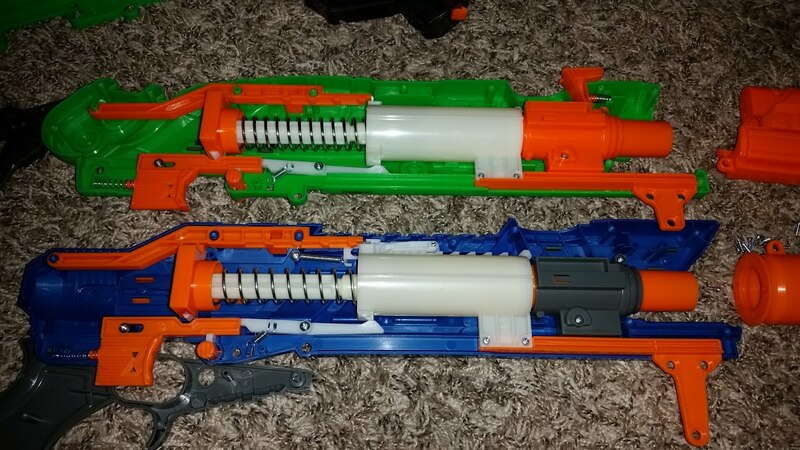 It’s not without issues, but it’s a solid alternative to Rival springers, and holds up well in stock and lightly modified settings, as well as HvZ-style games. For $16.88, it’s well worth the money. This entry was posted in Dart Blasters, Reviews and tagged adventure force, blaster hub, dart zone, prime time toys, review, rival on January 21, 2018 by BuffdaddyNerf. 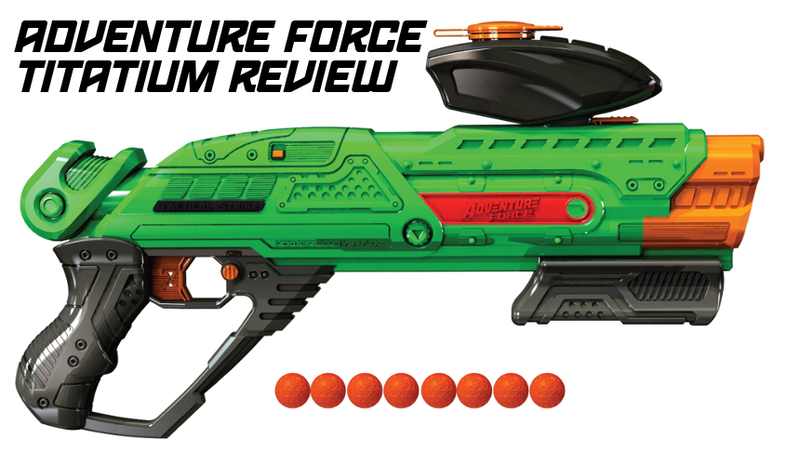 Adventure Force Accelerator Review Nerf Infinus & MEGA Thunderhawk Press Release!